Fresh Broccoli Salad with Crispy Bacon – Crispy raw broccoli, Spanish peanuts, golden raisins, and crispy bacon are mixed together with a creamy Greek yogurt dressing to make the best broccoli salad you will ever try. Great as a salad or accompaniment to any meal! It’s been a marvelous 12 days of vacation. We hosted family for Christmas, saw a total of 10 new movies (2 in theater and 8 at home), drank and ate wayyyy too much. Like I said, simply marvelous. January is the busiest time of the year for most accountants because we have to close the books for the previous year. And my job is no different. The first two weeks of the month will be madness. Plus, I still have all my normal tasks to do at home and this blog to take care of. Yikes. During this busy time, lunch can be a bit of a hassle. Many people eat out for lunch. But my wallet (and my waistline) cannot handle that. And I just don’t have the time to meal prep a new dish for every lunch during the week. That’s why I’ve been taking Lean Cuisine meals for lunch for years. It’s so easy to grab one from the freezer, pack a quick salad, and go. And it’s the best way to ensure I get the perfect amount of protein. One of my favorite meals is the LEAN CUISINE® Marketplace Sesame Chicken. I love the breaded chicken and the sweet sauce that they’re tossed in. Yummm. Most of my favorites are the Asian-inspired flavors: Orange Chicken, Chicken with Almonds, and Chicken with Peanut Sauce. I am such a sucker for a sweet or creamy sauce. My husband loves the cheesy ones, especially the Cheese & Bean Enchilada Verde and the Vermont White Cheddar Mac & Cheese. Who would have thought he loved the ones without any meat?! We just stocked up our freezer with meals for the next couple weeks. And since Lean Cuisine is on sale now at Target, you can stock up too! For the month of January, Lean Cuisine meals are only $1.99 each. Check out Target’s site to see which of your favorites are available. Usually, I pack a salad or fruit to go with my meals. Today, I want to share one of my favorite salads on the planet, that also pairs perfectly with the Sesame Chicken: fresh broccoli salad with crispy bacon. I first tried this salad when a friend of mine brought it to a tailgate this past fall. As soon as I tried it, I fell instantly in love! I am obsessed with raw broccoli (can’t say the same for the cooked stuff), but it wasn’t just the broccoli – it was the mixture of golden raisins, Spanish peanuts, crispy bacon, red onion, and creamy dressing that came together to make the perfect salad. I just had to have the recipe and she graciously shared it with me. I’ve been making this bad boy ever since! Another great thing about this salad is that you can make a large portion of it at the beginning of the week and eat a little of it each day. Since the broccoli is raw and, thus, very sturdy, it won’t wilt and shrivel up once it’s been coated in dressing. So it will taste great even days after making. I made a huge bowl of it the beginning of last week, with the intention of eating it all week long. But it only took me two days to go through it! I wasn’t kidding when I said that this is the best salad I’ve ever had. Crispy bacon doesn’t do well in the cold. So don’t add the bacon until you are just about to serve it. If you add it with the other ingredients and chill it, it will soften up. Spanish peanuts are milder in flavor and smaller than normal peanuts. I easily found them at my local grocery store so you should be able to, as well. But if not, you can substitute original peanuts – just use less of them and give them a rough chop. I hope you love this salad as much as I do. Don’t forget to stock up on your Lean Cuisine meals for lunch this week! You can get the full list of options on Lean Cuisine’s website. Which one is your favorite?? Let me know in the comments below! Crispy raw broccoli, Spanish peanuts, golden raisins, and crispy bacon are mixed together with a creamy Greek yogurt dressing to make the best broccoli salad you will ever try. Great as a salad or accompaniment to any meal! Cut off stalks of both broccoli heads. Chop broccoli into bite-sized florets. Place into large bowl. Chop onion into a small dice and add to bowl. Add peanuts and raisins. In a separate medium bowl, mix sugar, mayo, yogurt, and white wine vinegar. Add a little salt and pepper for taste, as necessary. Add dressing to broccoli mixture and stir until combined. Refrigerate for 1-2 hours or overnight. Crumble cooked bacon and set aside until time to serve. When serving, top salad with crispy bacon. Salad will keep for up to 5 days. However, the bacon will not remain crispy once refrigerated with the salad. This looks great! Broccoli is my favorite vegetable! I like lean cuisine meals. They are all very yummy and filling. I feel like I am eating something amazing without the guilt with their meals. Yum!! This looks delicious. I love the broccoli salad… I DEFINITELY need to give it a try. Thanks Rebecca! So sweet of you to check out my post. That looks amazing!!! I pinned it to my pintrest for later! and I cannot believe that the lean cusine is that cheap! they usually have very yummy meals. I love lean cuisine, it is the only one I get. This broccoli salad recipe is my favorite, I never heard of it either. My sister’s friend makes it and it is so addicting. Bacon just makes life better. This looks delicious! This salad sounds delicious! Although, I can go for anything with bacon in it! This salad looks amazing. Pinned to try .. thank-you so much for sharing! That salad! YUM — I just love broccoli salad, but never make it. Glad to have this recipe! And those Lean Cuisine meals look really good! Haha love that! I wish I loved veggies when I was younger. But sadly, that was something I learned in college. First, congrats on your Lean Cuisine sponsorship 😀 Big hooray! Secondly, I LOVE the broccoli salad! My three kids love broccoli and so do I. Yes, my kids love vegetables and eat them daily with no issues plus, they love bacon to. Win-win in our book with this recipe ~ thanks! Wow that’s awesome that your kids love broccoli! It took me years to get here haha. I hope the whole family loves this salad! I love broccoli parted with crispy bacon! Such a delicious flavor combo! im not a huge raw broccoli person but this salad looks insanely delicious! We are really trying to eat a lot better this year so this is getting pinned for sure. Also it just sounds AMAZING! First, I am totally with you on lean cuisines, I LOVE them! Second, I made this salad for christmas! It is one of my most favorite and now I have my family hooked! GOod luck with these first two weeks of work! You can do it! That’s awesome that you’ve already had this salad before. I can totally understand why they’re hooked – this is the best salad ever! And thanks for the encouragement! 1 day down!! Haha yes! We had a free HBO subscription so we milked it, for sure! What a great add on! This recipe looks so good, simply delicious! Thanks for sharing. This looks amazingly delish 🙂 I will have to try this with turkey bacon. That salad looks really good! I prefer broccoli raw vs. cooked, so this is perfect for me! I had a lean cuisine meal yesterday and was just thinking I needed more veggies with your. Your broccoli salad would have been perfect! Oh my! Everything looked so good! I’ll have to try these out. Holy YUMMY. This looks just like something my aunt used to make that I loved; defnitely saving this to make soon. As a side note – Lean Cuisine now makes the gluten free meals so I can actually enjoy them too now! Yes, thanks for mentioning that! That’s a huge win for the gluten-free community! 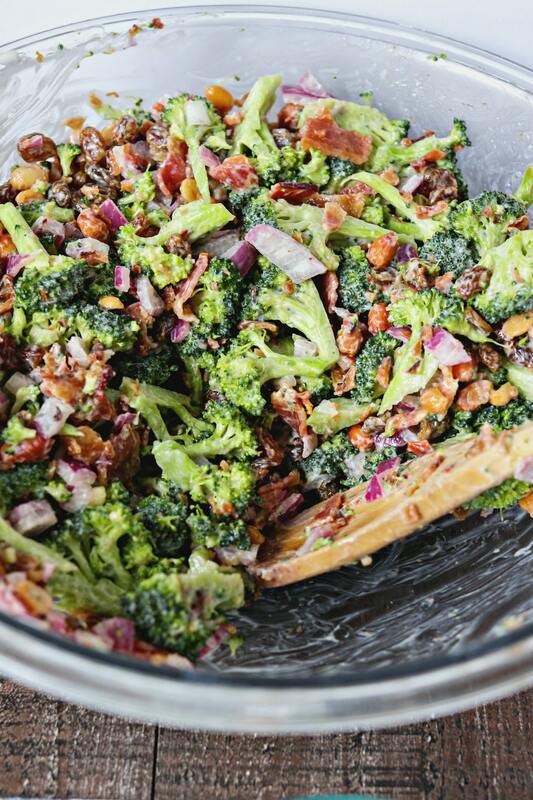 I would love this broccoli salad and adding the bacon would make my husband happy. Looks tasty! Would pain peanuts or possibly cashews work in this recipe? Of course! I would suggest using only 1/2 cup first and then giving the salad a taste. If you still want more, add another 1/4 cup. You may also want to chop up the peanuts or cashews so you don’t have such a bold flavor in each bite. Hope that helps!! The salad looks yummy. I think my hubby would even like it because he loves bacon! That salad looks delicious! And I must admit I just stocked up my freezer with Lean Cuisines to get me through my first week back to work after the holidays! So easy, and healthy! This is exactly what I needed! I was looking for some new lunches to try this week and I have a load of frozen broccoli left in my freezer! You had me at bacon! Hahaha, but seriously. What a great way to get the veggies in! I think I am the weirdest person alive: I love broccoli – it tastes really nice and fresh, but I am not a big fan of bacon. It’s true that cooked bacon is nice and crispy, but it’s not enough for me. I wonder if it will still be amazing without the bacon in. Haha that’s not that weird! I am definitely not obsessed with bacon like many people are. The star of this salad is the broccoli so it is still amazing without the bacon 🙂 Thanks for your question!